Fire Engines Photos - 1936 Dennis/Morris/Magirus 100ft TL. (Rear shot). 1936 Dennis/Morris/Magirus 100ft TL. (Rear shot). This picture shows from a different angle the rear of the 1936 Dennis/Morris/Magirus 100ft Turntable Ladder(BYV321)that was displayed on Saturday 13th August,2011 at the Redhill Steam Fair in Surrey,England. The appliance was put into service with the London Fire Brigade and served at Manchester Square Fire Station serving as a front line appliance before/during/and after the war until 1962,and then as a reserve TL until 1965. The appliance was one of 3 such TL's put into service in 1936 with the LCC-London Fire Brigade. Will this one be restored to what it looked like in 1936? Any idea where the other TL's are? Was TL19 scrapped? Added by Jeffrey Smoker on 18 August 2011. Jeffrey - we have custody of TL19 (CBY1) - it is still part of the LFB Fleet. Some LFB open TLs still exist as seen elsewhere on this site, but there are others (ELL121, BLC555), but the former's whereabouts is unknown to me. BLC is stored in Surrey. BYV322 is in Ireland near Dublin, BLC555 is in Surrey DGJ309 in Hampshire and ELL121 is in Cheshire. GT6694 chassis was scrapped in 1959, ladder and turret going onto VYE234. ALW478/479/480 all scrapped in the last 12 years (all in a dreadful state) which leaves BLC555 as the only survivor of its type. DGJ310 went to France with Rentokil, fate unknown. DGJ311, ELL122, ELL123 fate unknown. Added by Mike Hebard on 23 August 2011. 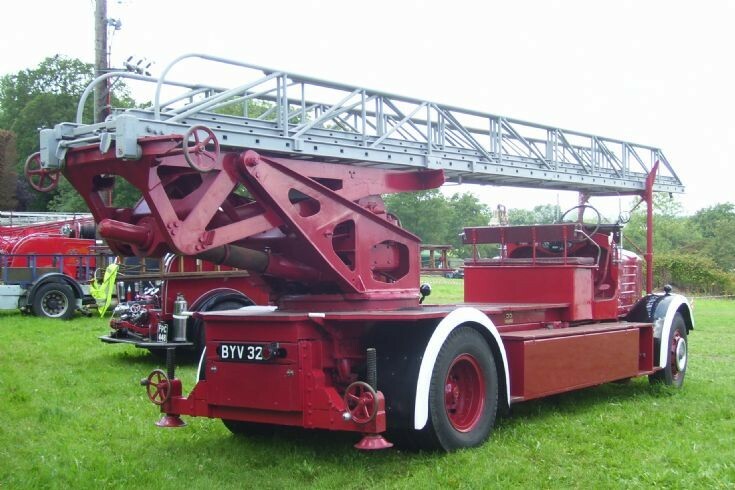 Having studied many pictures of the old Dennis/Magirus TLs, chiefly because we own BLC555 now, it appears to me that BLCs ladder went on VYE234 and not GT6694's. The reason I say this is the head of BLC's ladder is unique in LFB, and it seems GT's ended up on BLC for reasons I've no idea about. One of the previous owners swapped the ladders back around when VYE234 scrapped, and GT6694's turret and ladder now lies in a field very close to BLC. Confused?! I know I am! Added by Mike Cotton on 14 April 2013. Added by Barrie Green on 16 April 2013. Right I have the definitive. VYE234 was registered 1/1/59 and had the ladder set from GT6694 mounted at great expense at the time. In 1961 the Brigade bought 235CXP, same chassis but with a Merryweather B type ladder mounted. The choice needed to be made in 1962 whether or not to go with either type, and Merryweather was chosen from there on in. VYE234's ladder had manual plumbing, but when BLC came off the run in 1962 the ladder set was removed and planted on to VYE because it had automatic plumbing. Hence why in all the pictures up until the year 2000 when the chaps at Coulsdon scrapped VYE and reunited its' ladder with BLC. Thanks to Mike Hebard for this. Added by Mike Cotton on 16 April 2013. Byv 322is with the National Transport Museum of Ireland and is stored at their depot in West Wicklow it is a runner as from 27 7 14 and is on UTUBE. Added by Pat Kirwan on 27 July 2014. Added by Barrie Green on 31 July 2014. Cheers Pat, what do I search for ? Added by Mike Cotton on 31 July 2014. No need I found it!